On Rusty Trails: Elvis Lives, But Needs a New Place To Stay | "DESTROY ALL FANBOYS!" “Innovation” (cue angelic music or whatever you hear when that word is mentioned) is one of the most overused buzzwords in gaming “journalism” (another overused word clung to by some) and it’s clear that too many writers about games tend to try too hard to push the idea that if an new game isn’t “Innovative” it’s somehow lacking the necessary “fun” required that seemingly ONLY comes via “Innovation” (cue angelic music or whatever you hear when that word is mentioned). Well, Black Pants Studio has some happy hogs that need to be washing by some of these soulful-eyed scribes who seem to not be having FUN because they’re waving their “innovation” meters all over every game they play looking hard instead of cutting loose and having… well, you know what. So, Elvis is (no not THAT Elvis!) 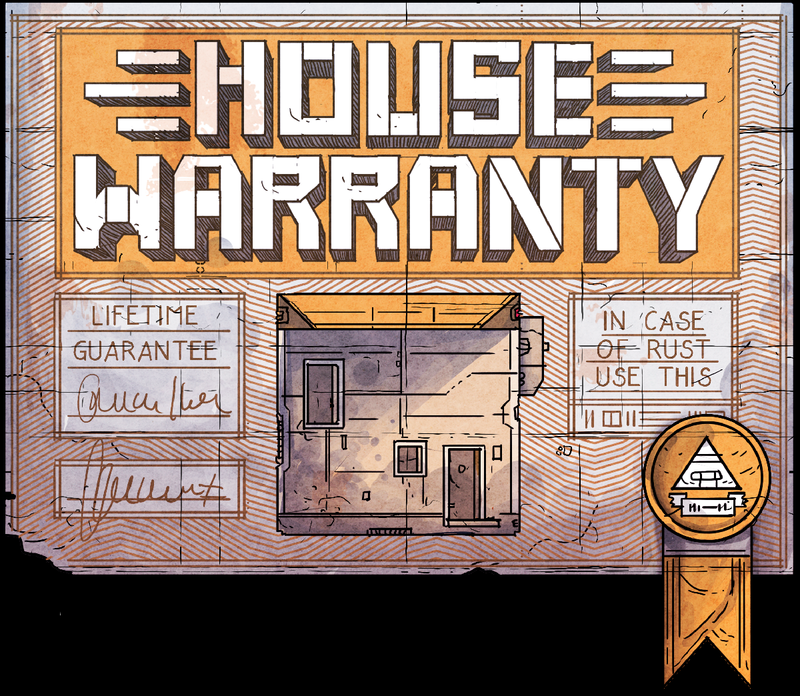 a humble little metal dude who just so happens to have his home blasted to scrap and as he’s still got the warranty card, he sets out to simply get that card redeemed. If this were the Elvis Elvis, all he’d have to do is snap his fingers and get driven to a new house (or one of many boats). 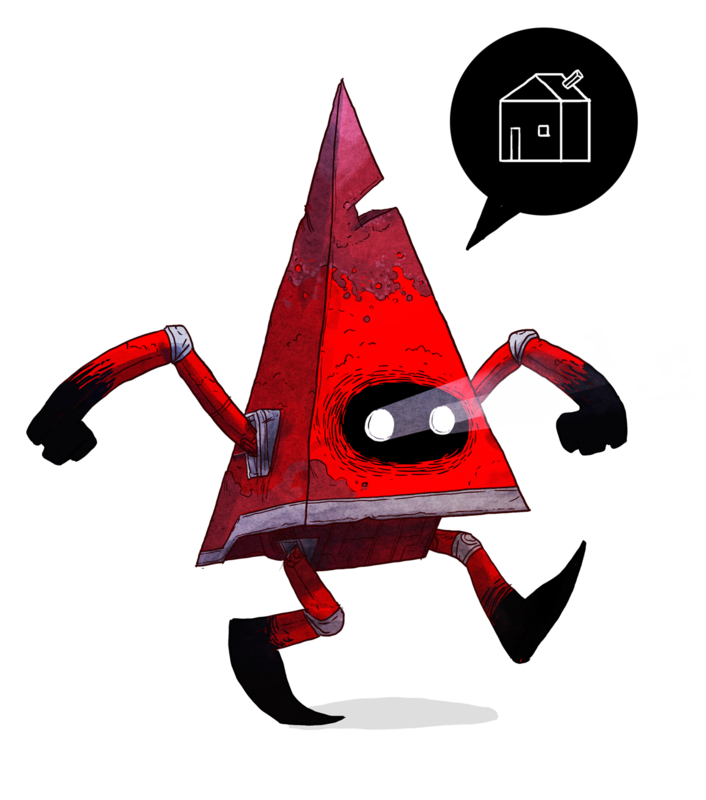 But ORP’s Elvis is just your average pyramid-shaped guy who now needs himself a new place to crash. 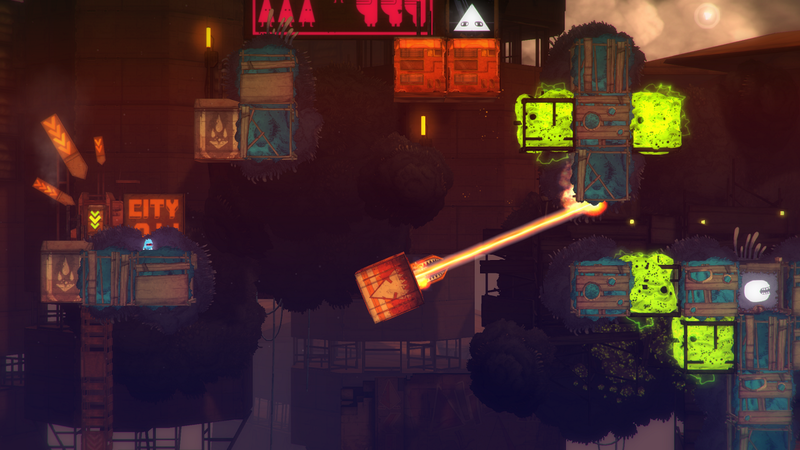 The game takes the classic side-scrolling platformer, adding both Elvis’ magnetism (no, not THAT Elvis! You guys, yeesh!) and the sleek “Switchy Suit” he needs to don in order to pass through territory occupied by somewhat hostile blue creatures. There’s other hostility to be found in the form of nature storming its way through some levels, falling walkways, unstable structures and other Elvis-killing hazards. The game’s got quite a lot of challenges to overcome and it’s keen level layouts will keep your eyeballs and reflexes busy and thrilled even if you’re not the best platform person for the job. Actually, success as this game demands you know platforming 101 PLUS be willing to experiment with Elvis’ ability to cling to metallic surfaces on any angle, switching to that Switchy Suit when applicable and do a fistful of jumping and perfect landings. Controls were excellent in the build, but the game is set up so you can’t anticipate failure unless you experience it a few times. Levels are open for you to travel freely (once you figure out the safe spots), but a timer at the end of each map lets you know how long you took to complete a stage. Expect many speedrun players to be all over this like a cheap Switchy Suit, I say. The game looks pretty awesome in motion thanks to Black Pants’ Scape Engine handling detailed environments, weather and many other visual effects in a nice illustrative style that gives it a comic-in motion look. While voice acting is non-existent, the storytelling through signs, symbols and easy to grasp imagery is also part of the game’s draw. The end result may not scream “INNOVATION!” at veteran players, but it’s a great looking “shut up and play it!” game with a quirky new character and a twist on classic platformers that’s a more than welcome treat. Does Elvis get his new home? Is there romance brewing at some point in the game like in some nostalgic classic movie on late nite TV? Does the experience want me to see more of our lot less angry Pyramid Head in new games in the future? 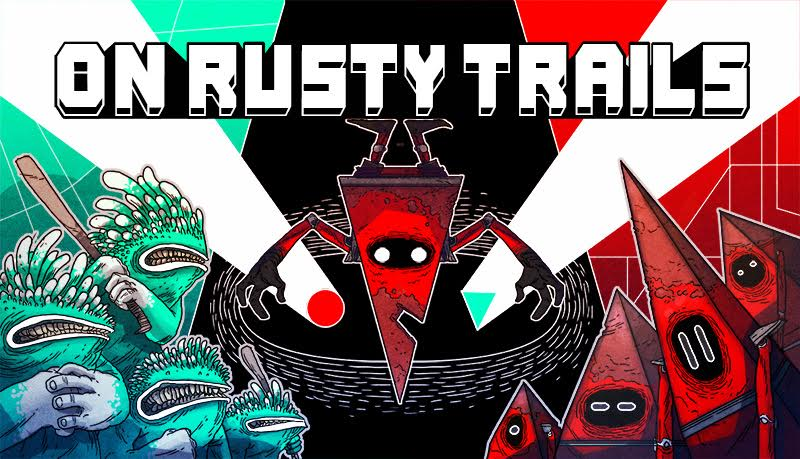 I won’t reveal anything other to say On Rusty Trails NEEDS to be put on your list of stuff to play in 2016. Black Pants has another super sleeper here that you’d better not miss if you’re one of those gamers who likes FUN at the expense on that one word that really doesn’t mean a bean in the grand scheme of gaming things. Now, if you can play the game blindfolded and with a controller made out of a hollowed out coconut wired to a Kinect and steering wheel, now THAT would be innovation. This game doesn’t need that mess because it’s a total blast to play, period. This entry was posted in 2016, Commentary, DAF, Features, Humor, Updates and tagged Black Pants Game Studios, Coming Soon, Digital Games, Downloads, Gallery, Imports, In Development, Indie Games, Indie Gaming, On Rusty Trails, PC, PC Games, Reviews, Screenshots, STEAM, Teasers, Valve, VGA 101, Videogame Trailers by geelw. Bookmark the permalink.